There is certainly no shortage of tools for today’s marketer to choose from when it comes to implementing a marketing strategy. The marketing mix has extensively ballooned over the last decade. When one factors in the prominence of an ever-powerful and social networking Web, it’s no surprise that even some of the brightest professionals are in a bit of a tail spin. What can marketers do with the seemingly “bouncing-off-the-walls” proliferation of new marketing rules, options and technologies? Is there a stabilizing construct that business leaders can utilize to harness marketing’s abounding brawn? The simple answer is, yes. Perhaps a brief, back-to-basics perspective will help recalibrate desired thinking and planning. The very (very) simple premise of marketing is that it is responsible for promoting products and services in order to effectively generate demand, as well as stimulate sales and growth for the respective company or individual. With this in mind, consider a straight horizontal arrow spanning from the left- to right-hand side of a rectangular whiteboard. The arrow is then separated into six sections of equal width. Each of the six sections represents a primary stage along the sales continuum. Within each of these stages, marketing strategies, tactics and tools can be formulated and prioritized; precisely for the phase at hand. Each of these stages are interlocking; living and breathing across a marketplace and sales continuum that ebbs and flows and relies on relationships, commerce and integrity to thrive. For planning purposes, however, it is okay to think of each stage as a “bucket” (not a silo, however). Within each “bucket”, potential marketing strategies and tactics can be added, with the notion that success in the first bleeds into the next and builds momentum; and so on. For sake of demonstration, six standard stages of the sales continuum are highlighted below. At this stage, a company lets the target audience know that their business exists, and that the solutions are viable and a great fit for them. Building awareness can be a narrow and targeted effort, and does not have to require a huge investment. In figurative terms, the entire kit of marketing tools can be dumped on the table and used to line up an arsenal of tactics that will most effectively (and measurably) initiate awareness and a pipeline of demand. At this point, the target audience has been exposed to the brand. They should have ready access to additional information, as well as being engaged with in meaningful and memorable ways. Simply, marketing can help communicate additional reasons for liking a product or company. What can a company do at this stage to really woo their potential customers? This stage of the relationship should be formalized; a company should go out of its way to set up a communications infrastructure that encourages an ongoing relationship with customers; one that can be actively nurtured (on their terms). A decent portion of a company’s marketing resources should be focused on customer experience and retention. This is the Petri dish of sustainable growth and profitability for a company and deserves ample attention. In addition to program tactics that are prime for this stage, marketing research should be leveraged to invent a winning loyalty and advocacy formula that can be applied to the organization’s customer base. 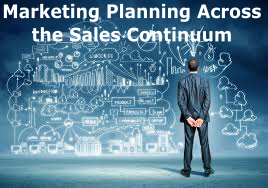 Setting up a sales continuum construct may help to organize the vastly growing set of alternatives business leaders have to choose from when it comes to marketing planning. This approach should not be limiting (the lines should be kept pliable!). Some may argue that marketing should not be all about sales; and that is right. But at the end of the day, that’s what it really boils down to.